Pack your bags and head for Asia! 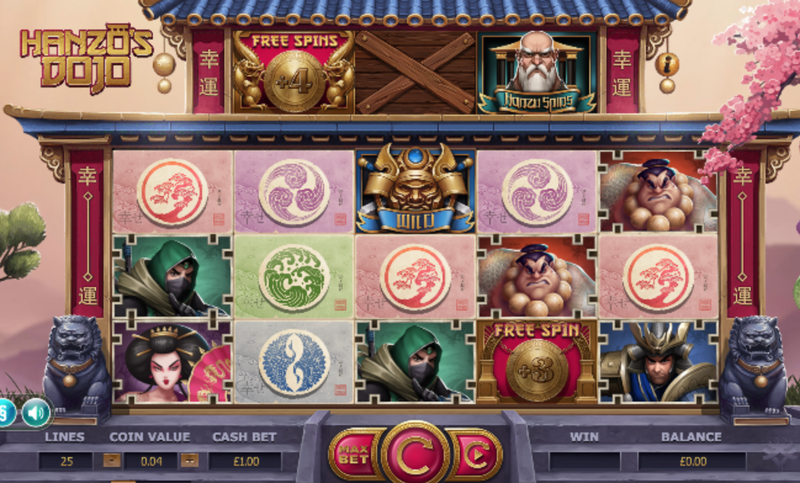 This online slot game provides the perfect getaway to the Far East and into the depths of Japan for an online slot game that provides a wealth of creativity and colourful theming, making it an extra special experience. What makes it even better is the opportunity to join Hanzo Dojo on a Japanese quest that gives players the chance to win 3,000x your bet. The character of Hanzo Dojo dates back to the 16th century and he is an iconic Samurai with explicatory fighting tactics. 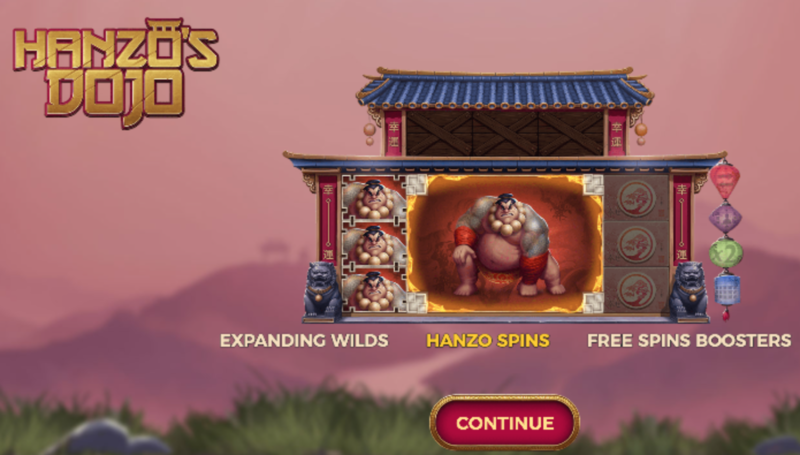 In this online slot game, Hanzo Dojo invited 4 of his highly trained men to battle their way to victory with their martial arts skills. Read more about what Easy Slots has to offer! As always i-Gaming software develops high quality slot games which are focused on strong theming. Yggdrasil is a Malta based company that has being in existence since 2013 and aims to provide more thought behind the themes. To put in it context the company name is derived from Scandinavian Mythology and stands for a large ash tree, home to eagles and dragons. Their games showcase high quality animation which are multi-functional across a variety of platforms. This HTML5 format game is a bit different to standard and the reels are divided into two sections. The bottom part being 5x3 reel formatted and the top is a single line slot with three different spin boosters. The bet lines start very low at 0.10 coins for 25 pay line the maximum is 123 coins. There are 8 pay symbols. Low paying symbols include beautiful wind storms, bonsai trees, cranes (tsuru) and waves. Then enters the 4 fighters: the ninja, samurai, sumo and a mighty female fighter. Hanzo himself will only appear in the top reel. The wild symbol is a Japanese warrior mask which expands to multiple symbol positions when landing on the top reel. The scatter symbols come in the form of flat gong bells and they hand at the bottom of the game by 2 dragon; adding extra spins and booster the free spins round. 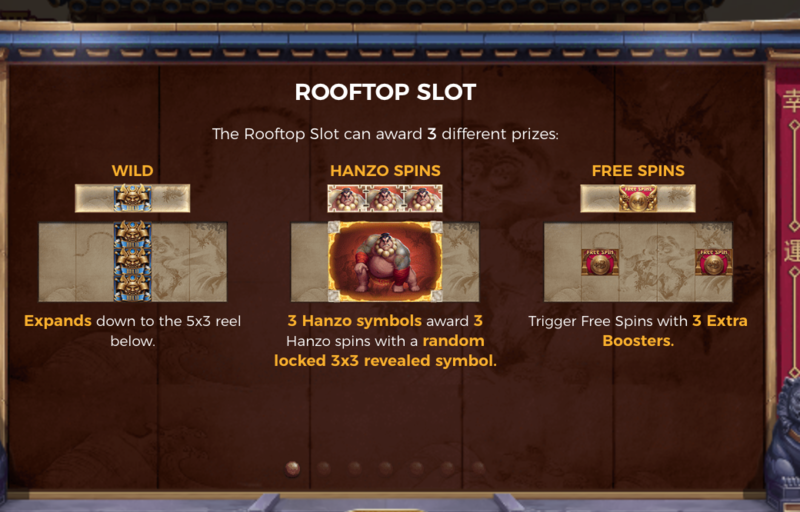 Each standard scatter symbol will reward 3 free spins and the rooftop scatters will reward 4 with an additional 1 of 5 boosters. For example, the fist booster is a x2 multiplier. Then there is a win both ways booster which is triggered from a free spin round which pays all wins from left to right and right to left. Then the wild fifth reel booster will turn the last reel into a sticky wild for the rest of the free spins. The 3x3 symbol nudge booster will see the 3x3 bloc on the middle reels nudge by up to three positions to give the best possible outcome for the spin. If you're a big fan of bonuses and promotions, click now to see our full range! Hanzo’s Dojo is definitely a slot that provides great entertainment for its fans. The graphics and animations create a great setting which will really take you into the depths of Japan. For example, you can see this in the blossom trees in the background. Ultimately, it has good win potential exceeding 3,000x your stake and unique boosters for the free spins. The rooftop single reel is an additional feature to keep you entertained! Easy Slots is all about the Easy Slot games, of which we have loads! Click the link to find them out.